The United Kingdom is experiencing a period of extreme rainfall and an onslaught of Atlantic storms. This has resulted in extensive and prolonged flooding of the Somerset Levels and a rise in the levels of the River Thames not seen for over 60 years, flooding many homes for the first time since these were built. Politicians and journalists want to know from scientists whether or not this period of unparalleled weather is linked to climate change. Responsible scientists reply that it is not possible to link a specific event to climate change, but note that there is a high probability that climate change will result in more intense and possibly more frequent extreme weather events such as the one we are experiencing now. Seeking to understand the link between climate change and weather addresses one facet of the reasons behind the floods in the United Kingdom. However, the way in which we have altered our landscape (and what this means for our resilience to floods) remains a largely underexplored issue. We live in a cultural landscape. Over a period of six millennia, forests have been cut to make way for agricultural land, peat bogs and marshes have been drained and cultivated, rivers haven been canalized, coasts have been embanked, and bridges and quays have been constructed. All these activities have an impact on flooding, either by reducing the natural flood-retention capabilities of the landscape, or by restricting the natural flows of rivers and sea. Without an understanding of these longer-term developments, it is impossible to explain the floods. 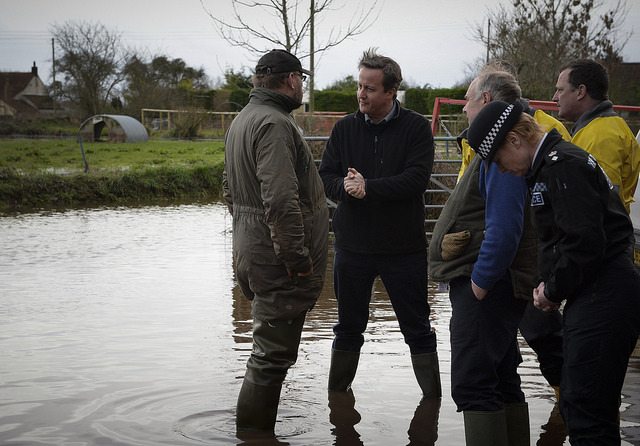 David Cameron visited Somerset to see the impact of the floods and meet local residents, farmers and emergency teams. The Prime Minister’s Office. Crown Copyright via Flickr. Thus, the floods in the Somerset Levels are directly linked to their past. Up till around 4500 BC, the Somerset Levels were an inland sea, but a coastal barrier prevented further sea incursions and extensive peatlands developed over the following millennia, raising the lie of the land above that of the sea. These peatlands have been drained for at least a thousand years, but this was initially done in a sustainable manner. However, the modern utilization of the Somerset Levels for peat cutting and farming have resulted in the creation of more drainage ditches that lower the water tables and this has caused (especially where combined with nitrate and phosphorous fertilization, which accelerate the oxidization of peat) the desiccation and loss of peat. As a consequence, the lie of the land has fallen in some places by as much as 4 m, and some 635 square kilometres of the Somerset Levels are now below sea level, making the landscape more susceptible to flooding. Similarly, the River Thames has its origins towards the end of the Palaeocene and established its current course around 20,000 years ago, when its former northerly route was blocked by the ice sheets that covered much of northern Britain. Throughout prehistory, people have utilized to good effect the natural resources of the marshes and meadows without significantly altering the natural river. This changed with the urbanization of southern England and the need for more transport links, which encroached onto the floodplain of the Thames. The post-war housing shortage has led to an explosion of construction of new houses on the Thames floodplains, alongside industrial estates, roads, and other infrastructure. This reduction of the land available for flooding and the constriction of the natural course of the Thames are major factors behind the current floods. The impact of climate change on extreme weather events and sea levels is becoming increasingly clear and our thinking of dealing with floods is changing, and not just in the United Kingdom. Understanding the past is a key component in this rethinking. Thus, the natural flood-retention capabilities of the landscape is being improved through the restoration of peat bogs, the de-canalization of rivers, the restoration of floodplains and (so-called) managed re-alignment schemes on the coast. The impact of climate change on people, especially those living and working in flood-prone areas, is not so well understood. We, too, could benefit from a greater understanding of how our predecessors dealt with floods and changes in the weather and climate. I am not advocating a return to prehistoric housing and infrastructure, but using the past to strengthen the resilience of local communities by engendering: a sense of place specific to living in a floodplain; an understanding of past successes and failures in dealing with floods; and a better understanding of long-term interaction between floods, storms, and climate change. Robert Van de Noort is Professor of Wetland Archaeology at the University of Exeter and chairs the South West Regional Flood and Coastal Committee, the executive committee through which the Environment Agency performs its flood and coastal erosion function in the South West of England. 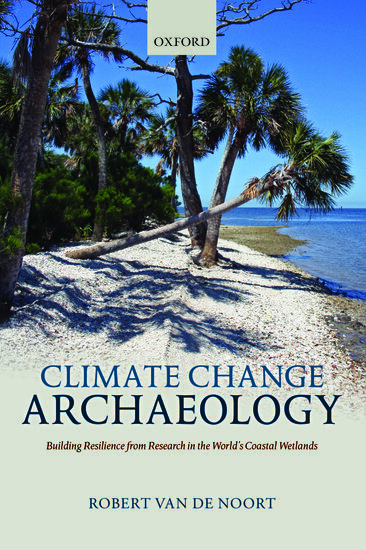 He is the author of Climate Change Archaeology: Building Resilience from Research in the World’s Coastal Wetlands. I enjoyed the above article and agree with all it’s points but it is not only the environmental changes wrought by man that contribute to the lands inability to retain more water, but the removal of species such as beavers that dammed water at a higher level and slowed the flow of water into the lowlands that is also missed. OS Landranger map sheets 182 & 193 covering the Somerset Levels do not seem to show any spot heights less than 3 metres above mean sea level. Therefore, I cannot see how it is possible for such a large area as 635 square kilometres to be below mean sea level. This dubious statement also appears on the Environment Agency’s web-site. Because of the huge tidal range at the mouth of the Parrett, it is true that parts of the Levels, though nothing like 635 sq. km., are below the peak high tide mark. According to the map, Muchelney is 8m above mean sea level, so it is still 2 or 3m above peak high tides. Part of the City of Cambridge is only 9m above mean sea level! The Environment Agency’s statement is based on recent LIDAR (LIght Detection And Ranging) measurements of the Levels, which provide the most accurate mapping available to us. The Ordnance Survey spot heights have been taken from upstanding and ‘stable’ structures such as roads and bridges, but rarely from the peat surface itself simply because this is not stable. And it is the level of the peatlands that have fallen so much due to desiccation. Many of the OS spot heights are also quite old. The highest point in Muchelney may well be 8 m above sea-level, but Muchelney was not flooded (only the edges), and the misery was caused by floods isolating the village.